Porsche Sport Classic II with Michelin Pilot Super Sport 225/40/ZR18 front and 265/35/ZR18. The wheels are perfect the tires have less then 900 miles on them. My loss is your gain, let me know if you have any questions or if you need more pictures. I am in central Phoenix Arizona so if you’re in the area please contact me to stop by. 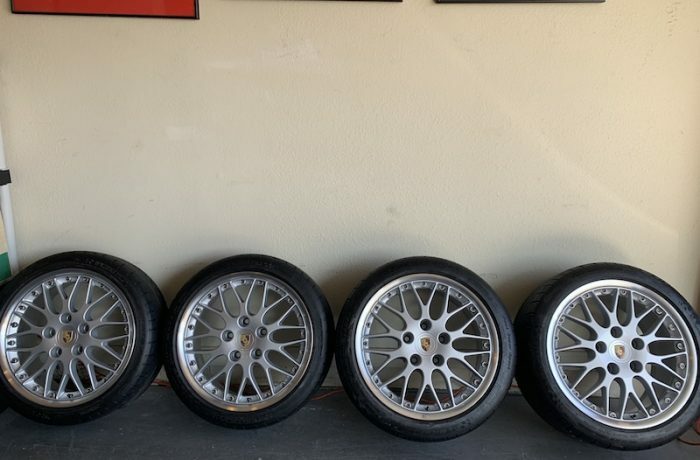 The wheels and tires have been in storage in my garage for about 1.5 years and we’re on my narrow body 993 but these also fit many other models. I am cleaning out my garage so they’ve got to go. Why spend $4800 when you can buy these like new wheels for a fraction of original price. Porsche center caps are included.